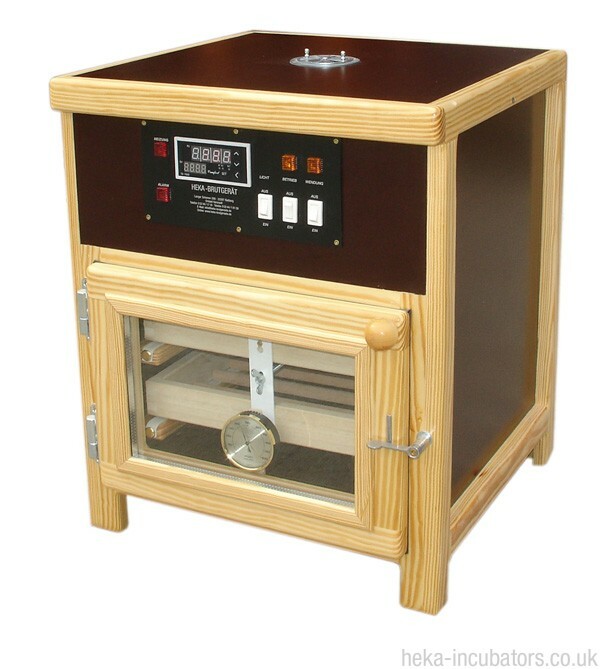 Wooden Hatcher with Digital Temperature Control, Double Glazing, Analogue Hygrometer, Manual Humidity Control. The HEKA Standard 3 hatcher has three uncovered hatching baskets and manual humidity management. You can upgrade to covered hatching baskets, which include dividers, if you are doing selective breeding and need to know which chicks came from which eggs. Note: the picture shows the Standard 3 incubator, which has the tray turning connectors on the front of the trays. The machine has easy to use controls for managing temperature and an on/off switch for the interior light. To manage the humidity level, simply fill one, two or three of the compartments in the water tray at the bottom.